"Of course I was scared and I was nervous, but I never panicked. It was important to remain cautious in the technical sections and ride as hard as possible on the straights. I could not make any mistakes and I did not." 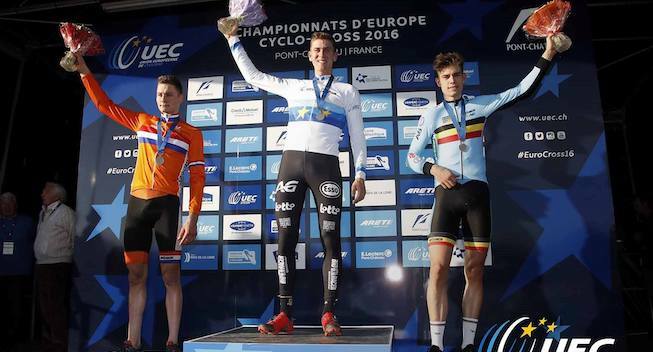 Wout van Aert has to wait for his fourteenth win of the season. In the GP Sven Nys, Toon Aerts rode to a solo victory. "In the beginning, I rode around with too much fear," the world champion admitted afterwards, "so it took some time to get going. We have gathered a few reactions. With no Mathieu van der Poel at the start, Van Aert seemed to be heading for an easy victory in Baal where he has taken the win the last two. But there was no third win in a row. "It was my own fault," Van Aert told Het Nieuwsblad. "In the beginning I was riding with a little too much fear in the frozen corners. I did not take too many risks because of what is to come in the next few weeks, but that obviously cost me time. It took too long not to be afraid in my head and it took me too much time to get going. I did not have super day and that didn’t help me either. Van Aert also briefly hit the wooden fence. "I hit the fence on the circuit. I hit it with my hip and had a lot of pain. But I do not use that as an excuse. It was not where I lost the race. I just had a tough day and I only got that good feeling in the very end. I also took the turns better when I got tubes with less pressure, but then it Tom and Toon were already gone. However Van Aert was still getting close in the final lap. We have to go back to the race in Spa-Francorchamps on December 3 to find winner Toon Aerts’ last podium appearance but he has shown his good form with three fourth places (in Loenhout, Heusden-Zolder and Diegem ) in the last few days. Immediately after the start Aerts rode away with teammate Meeusen pace and they got a big gap. "That gave me wings," said Aerts. “If you can start like this and have an edge in the cross of your boss, you can do that little bit extra. Besides, I had an ideal teacher in Tom,” added Aerts in praise of his teammate. "I only had to follow him in these difficult technical sections and he allowed me to know how I had to tackle it." Wout van Aert was still getting close in the finale, but Aerts did not succumb to the pressure. Lars van der Haar rode in his new Telenet-Fidea Lions jersey for the first time. The Dutchman started again in the World Cup in Heusden-Zolder after a muscle injury. He makes progress, but is far from his former self. For the first time in weeks, Michael Vanthourenhout (Marlux-Napoleon Games) was again allowed to stand on the podium. The last time it happened was on October 23 at the World Cup in Valkenburg. "I am very satisfied with this result," he said afterwards. Vanthourenhout started the season well with several podium finishes and two victories but has been off the pace since November. In recent weeks, there has been improvement and he has showed himself among the first a few times. It earned him a sixth place in Bredene and Heusden-Zolder and a fifth place in the Azencross. On New Year’s Day, he was finally back on the podium with his third place. However, he seemed on the way to a second place for a long time, but he finally had to admit defeat to Van Aert. "It was hard to keep Wout at bay," he admitted, "and I knew that he would go full gas in the final lap. So I had to let him go. I still made every effort to secure that third place. I can live with this." The Belgian returns home with a good feeling. Klaas Vantornout didn’t finish the race. The Marlux-Napoleon Games rider who made his comeback after illness in recent days, rode into the fence in Baal and was taken away from the circuit by the medical staff. Wout Van Aert also complained about the new wooden fence which was used for the entire length of the course. "I hit my hip hard against the fence," he said. "The whole course was surrounded by it. I do not think it is ideal for a cyclo-cross course." Vantornout agreed. He had to end his race after a collision with the fence where he hurt his head. Despite the heavy blow, the damage is not too bad for Vantornout.